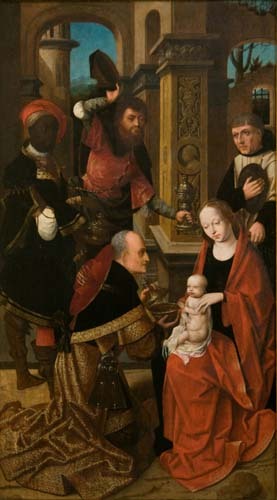 This painting depicts the New Testament story of one of the most popular devotional images in Christian art, the Adoration of the Magi. After Christ was born, three wealthy Magi, or Kings, from the east came to Jerusalem seeking the one "who was born king of the Jews." When they found him near Bethlehem with Mary and Joseph, seen here standing behind the Virgin and infant Christ, they "bowed down and worshipped him, opened their treasures and presented him with gifts of gold, incense and myrrh."